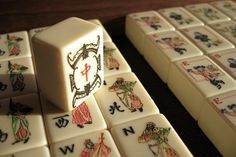 Our Mah Jongg group meets on the 1st and 3rd Tuesdays of the month from 1 – 4 PM at member homes. Contact JoAnn for more information. The group is seeking new members. No prior experience required. We play American Style Mah Jongg–a fast-moving game that is a mix of strategy and luck–fun for beginners as well as experience players! Game sets are provided. This entry was posted in Interest Groups and tagged mah jongg on August 26, 2016 by slhansen.